What can photographers learn from watching films? 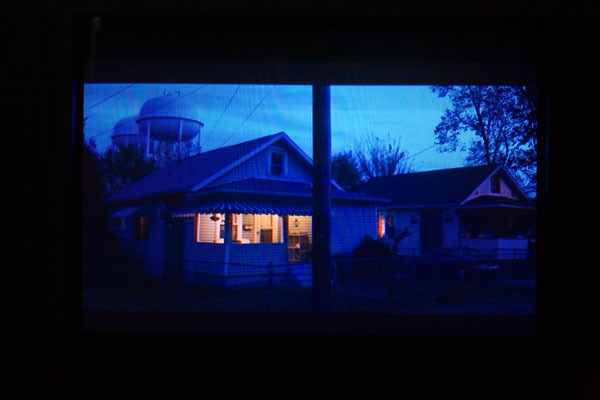 I recently watched Steven Soderbergh's movie "Bubble " and was so taken with the composition and lighting in many of the scenes that I performed some photographic analysis of my favorite shots by shooting screen captures of the images. You can see the results in a photoset on flickr. Featured Comment by Don: "Check out the recent (last couple years) movie 'Girl with a Pearl Earring ' for the same reasons. Lighting, composition, color harmony, etc. are incredible." I'll agree with the Vermeer movie, but add that most of his painted work has amazing use of light, shadow and colour. I want to avoid buzzwords like dynamic, so yeah. A lot of the dutch of that era did amazing things. Franz Hals, Vermeer (I'll omit that hack Rembrandt just to be spiteful). May I suggest Wong Kar Wai's "In the mood for Love" and "2046" for composition, and the use of lights and color ? I can't remember any other film having such a visual impact on me. The thought that photography translates [from Greek, I believe] as "writing with light", it shouldn't come as much of a surprise that, when its all said and done, we're still talking about lighting or "the light". Having worked in the commercial photography arena for ~15 years prior to digital it was never even a subject of discussion. Okay, film types and processing techniques had their place but what will always give rise to any real talent in photography and probably even more so in film is the lighting. Check out the scene in "Sideways" were Paul Giamatti's character is discussing the virtues of wine with Viginia Madsen's character. He's just sitting in this easy chair taking but the lighting on his face and the light in the background and the contrast that is create by the use of color is classic in many ways. Haven't seen the Vermeer movie, but I'll add it to my short list. I am a big fan of Wong Kar Wai. One of my most favorite films ever is Jean-Pierre Melville's Le Samourai. If you are into street photography and/or shoot black & white, this is a must see. To my mind at least "photography" is "light writing," in the sense that light is what's DOING the writing. I don't know if this is really supported in the etymology or the history, but it's an important distinction as it places the "agency" with the light itself rather than with a human controller who is doing the writing and using the light as a tool to do it with. Does that make sense? This doesn't contradict any of the things you've said, just thought I'd mention it.